Music and Art classes are offered at St. Francis once or twice per week for all grades. The students’ work is displayed throughout the school, and the musical talents of the entire school are showcased in our Christmas and Spring concerts. 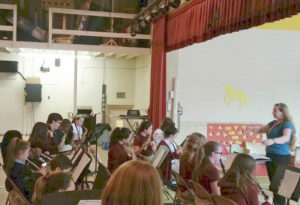 In addition, students may choose to learn to play an instrument and participate in Concert Band, County Band, and private instrumental lessons. Our middle school students may choose to be in our Mass Choir and lead the liturgical music at our weekly school Masses.